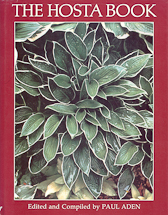 Paul Aden, who has introduced dozens of new hostas into cultivation, wrote six chapters and contributed many photographs to this classic. Other contributors include John Elsley, Yoshimichi Hirose, Graham Stuart Thomas, and André Viette. This was the first contemporary book on hostas and played a role in helping to bring these versatile shade-lovers to their current level of popularity.